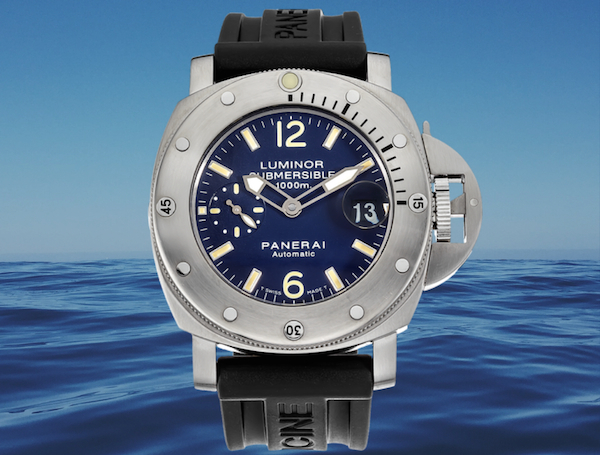 Home » Watches » Submersible PAM087 What is the Panerai La Bomba? 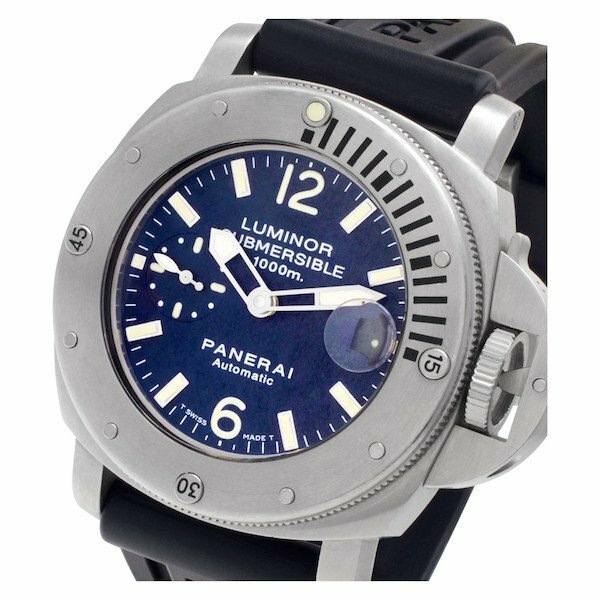 Submersible PAM087 What is the Panerai La Bomba? What is the Panerai La Bomba? Catchy nicknames are part and parcel of watch collecting. You’ll often hear names like the Rolex “Hulk”, the Omega “Speedy”, and the Audemars Piguet “Beast.” Panerai is another brand with plenty of unique monikers. Today, we’ll be looking at the Panerai “La Bomba.” Don’t know what that is? Then, brush up on your horology lingo and learn about the Panerai La Bomba. 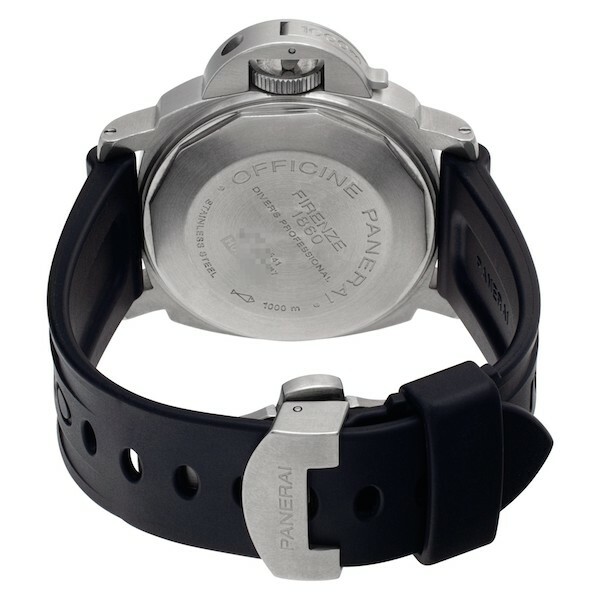 In 2000, Panerai unveiled its first Submersible model. For those who may not know, the Submersible lineup is Panerai’s collection of modern-day dive watches with all the essential requirements of a diver such as a unidirectional bezel, high water resistance, and high luminescence. Although all of Panerai watches are essentially based on the company’s rich heritage of making military dive watches for the Italian Navy, those vintage watches do not adhere to today’s ISO 6425 standard for diving watches. But the Submersible watches do. The maiden Panerai Submersible was the PAM064 and due to its heft, size and wrist presence, it quickly picked up the nickname “La Bomba.” which is Italian for “The Bomb.” It was the first Panerai watch water resistant to 1000 meters and only 500 units were produced. On its 44 mm case sat a 5.1 mm domed sapphire crystal and a helium release valve at 9 o’clock. The steel case housed a black dial with large luminescent tritium numerals and stick hour markers, a date window, a running seconds subdial, and large tritium coated skeletonized hands. Although Panerai’s main business was supplying the Italian Royal Navy in the 20th Century, they also made instruments for other nation’s military including the Egyptian Navy. For instance, there’s a 1950’s Panerai “Egiziano,” which had a revolving bezel calibrated for five minutes and crown protecting bridge. 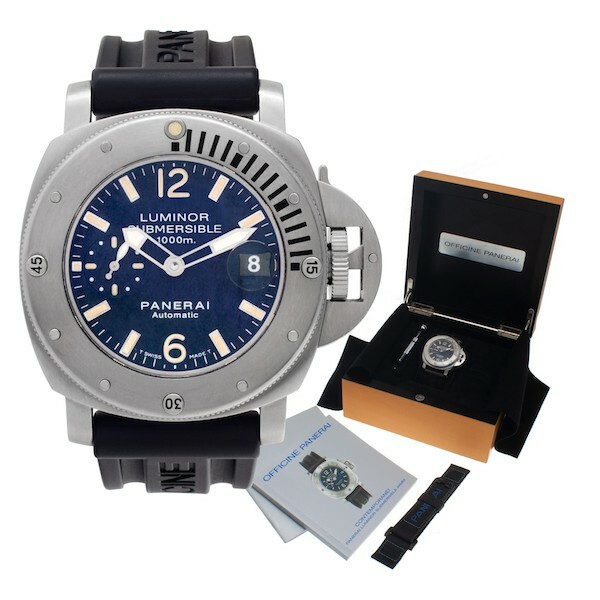 And the Panerai La Bomba Submersible PAM064 modeled its bezel after that vintage navy dive watch. Much to the chagrin to those Paneristis that purchased one of the 500 limited-edition Panerai La Bomba models, the brand released a new iteration of the watch just one year later with the PAM087. The new Panerai La Bomba included a blue dial rather than a black like the original version. The Panerai Luminor Submersible PAM087 “La Bomba” sports a 44mm stainless steel case, a vibrant blue dial, and a black rubber strap. Similar to the first, this version of La Bomba also includes tritium details on the dial–a feature collectors appreciate due to the way the substance develops a unique patina over time. There’s the helium escape valve at 9 o’clock (to release built-up helium and other gases during saturation diving to prevent the crystal from popping off) and the 1000-meter water resistance too. Unlike the contrasting one on the PAM064, this PAM087 includes a matching blue constant seconds subdial at 9 o’clock, which offers a more seamless look to the face of the watch. There’s also the date window on the opposite side at 3 o’clock. Characteristic to all Panerai Luminor watches, the Luminor Submersible PAM087 features the signature winding crown bridge protector protruding from the right side of the case. Operated by a lever, this mechanism serves to push the winding crown into the case to ensure the dive watch’s watertight construction. The unidirectional bezel includes markers at every five minutes (in addition to the first 15-minute markings) to facilitate keeping track of immersion times. In true dive watch form, the Luminor Submersible PAM087 is fitted with a black rubber strap, complete with Panerai branding and a steel pin buckle. When you’re in the mood for a different strap, the watch band can be easily swapped by unscrewing the lug screws. The Panerai PAM087 runs on an automatic OP III movement with a 42-hour power reserve, which is safely protected by a solid steel caseback. The caliber has hacking seconds (where the seconds hand comes to a complete stop when the winding crown is pulled out) for precise time setting and a quickset date (where the date is set independently from the center hands). 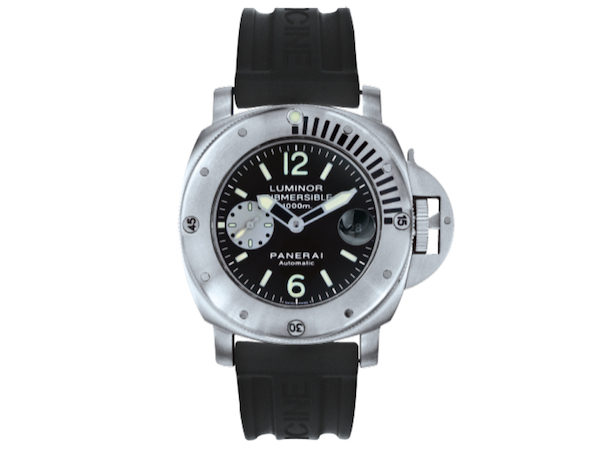 Living up to its “La Bomba” nickname, the Luminor Submersible PAM087 makes a loud statement on the wrist. This is a proudly oversized and robust piece to wear that will capture the attention of onlookers.